Music fans geeked out for Record Store Day, have a new bedside companion until the next incarnation of the annual event. 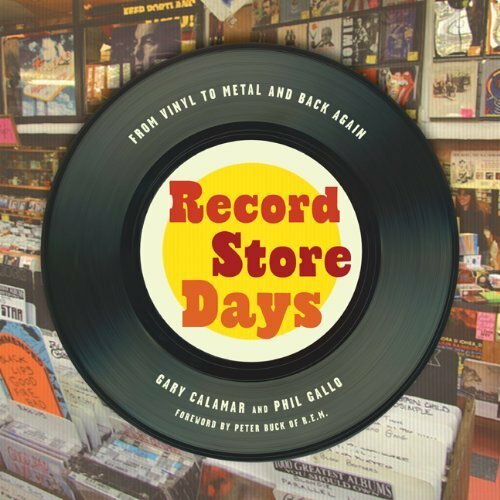 In “Record Store Days,” Gary Calamar and Phil Gallo have loving assembled a history of their musical Mecca. The tome operates on several levels. The bountiful pictures that depict the stacks, musicians and proprietors of record shops qualify the book as a fetish object. It’s easy to get lost in the details, such as trying to identify the covers on display during Elvis Presley’s trip to a Memphis shop, or getting lost in the promotion displays in a picture the counter at The Holiday Shop, a Roeland Park, Kan. store in the 1950s. The chapters are quickly paced, and contain lots of headers, so they can be read in bits and pieces. There are nearly as many sidebars as photos. The insets tell the stories behind the most outlandish names, like Minneapolis’ Oarjokefolkopus or Los Angeles’ Licorice Pizza, chronicle the history of record stores in movies, and tell about finding that first love in the racks – musical or otherwise. Along the way, plenty of musicians, owners and fans relate their favorite vinyl experiences. Finally, the book offers a comprehensive history of the independent retail industry. The story starts at the turn of the last century, when records were sold in furniture stores as an accoutrement to Victrolas and other record players. Like everything else, music sales declined during the Depression, and the materials used to create the platters were scarce during World War II. The record store as we know it blossomed in the 1950s, and enjoyed a heyday in the 1960s and ‘70s. The spaces almost became alternative community centers, where music fans would swap songs and stories while digging for the latest gem. The final half of the book also serves as a cautionary tale of the industry. CDs gradually replace vinyl, but when the bubble bursts in the late ‘90s, neither the major labels nor the stores have anything to replace them. Particularly telling is the story behind SoundScan, the computer-based sales tabulator that destroyed the manipulative hand tallying. “Record Store Days” ends on a happy note, with the opening of Amoeba on Sunset Boulevard in Los Angeles and the recent resurgence of vinyl. The final chapter discusses the founding of Record Store Day and is sunny enough to convince anyone to hop in their car and run to a record shop as soon as they finish the page. The book doesn’t try to be objective. It reads like a loving embrace written by people who love vinyl, for record fans. The book’s biggest flaw is that too much of the action is centered in Los Angeles and New York. There are some mentions of Criminal Records in Atlanta, Waterloo in Austin, Texas and Oarjokefolkopus, but little else occurs between the coasts. Some love for the great college town record shops would have been a welcome – and diverse – addition. Calamar and Gallo are not out to convert new fans to the cult of vinyl, and readers will quickly know if they are in the target audience. (Hint: If you don’t think it’s cool that the record on the cover actually has grooves, this book likely isn’t for you.) The duo knows the next best experience to being in a record store is reading about record stores, and their offering does a great job of taking fans there. The major labels may be lumbering in the past, but Sub Pop is starting to show hints of recognizing the digital revolution. Starting this week with “Wincing the Night Away,” The Shins’ highly anticipated third release, fans who order any LP from the Sub Pop catalog will receive a coupon for a digital copy of the album. Simply go online, enter the coupon information and start legitimately downloading the files. This is a great idea that also highlights the CD gradual slide into obsolescence. The first thing I do when I get a CD is rip it to my computer so I can put it on my iPod. There’s no point in gathering armfuls of plastic discs for road trips or worrying about if they might get scratched: the music is all safe on iPod, which can hold more than I could dream (or dare) to take anyway. But for all their handiness, digital files don’t quite scratch the musical itch. There’s nothing to have or hold in a file that suddenly appears on a hard drive. Vinyl, the Shins and Sub Pop have realized, is the perfect remedy. Fans get big artwork, lyric sheets with type large enough to be read, and extreme gratification from the scratchiness that pops from the speakers when the needle is dropped. If listeners don’t yet have record players, they’ve at least got a cool oversized souvenir of their direct support of a band. Hey, it doesn’t cost much more than iTunes and you get more, both physically and emotionally. Hopefully more bands will follow suit in the future, but for now, it will be fun to watch where this experiment goes.